Hey parents, make your kid an All-Star! Purchase the ultimate kids club membership for your super fan and get BIG TIME savings and benefits for the Flames, Hitmen, Stampeders and Roughnecks seasons! *Not to be combined with any other offer. Adult/Senior season tickets do not apply to the purchase of an adult ticket. 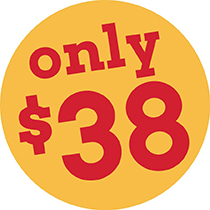 Get more than $380 in value for only $38. Plus, add in the retail discount and the $2 Hot Dogs and you have a real All-Star deal! Purchase a membership today! Please note: Club All-Star swag bags with membership cards are available 48 hours after purchase from the Scotiabank Saddledome or McMahon Stadium Ticket Offices.